I’ve been riding in this Kieffer Norbert Koof FL for several months and it’s currently in the top position as my favorite saddle. It fits Freedom beautifully and it’s a nicely balanced saddle that’s comfortable even on long rides. My name is Liz and I am a saddle addict. It’s true. I have a real problem when it comes to saddles. On equine bulletin boards I read about people who have dozens of saddle pads or maybe polo wraps. They fret about the compulsion to buy more. Not me. I could care less about those things. For me, it’s saddles. It’s probably just as well that I have two horses now as it makes the fact that I have about 12 (more or less, I try not to count), saddles in my tack room. Actually, I spread them out over two tack rooms and my basement. Over the course of the last few months I’ve bought four saddles and sold two. The first was a Berney Brothers jumping saddle. I thought it would be a good foxhunting saddle, and it was a good deal. I thought it was a decent saddle, but it didn’t overwhelm me. I hunted in it once and then put it up for sale. Luckily, it sold very quickly and for a bit more than I’d paid for it. The next saddle was meant for Zelda. I had been looking for a Kieffer jumping saddle with a synthetic tree so I could adjust it for her and then refit it to Freedom when she sold. I finally tracked one down in Connecticut. It turned out that the woman selling the saddle lived not too far from where my mother lives in Rhode Island, so we met in the parking lot of a TJ Maxx. I felt slightly illicit sitting in my car with an envelope full of money, and it crossed my mind that maybe I should stop meeting strangers in parking lots to exchange cash for leather. However, the lady was delightful and the saddle was just what I was looking for. It never made it onto Zelda’s back because it fits Freedom so well. The saddle exceeded my expectations. I’m not a big fan of blocks or knee rolls but this saddle has front blocks that don’t get in the way, the flap is forward enough to take up my leg, and the seat is flat enough that I don’t feel trapped. I’ve hunted several times in it and it’s my daily riding saddle right now. I know that German saddles are not the “in” thing these days — in the hunter world everyone wants the soft, buttery French saddles. But I prefer saddles that are wool flocked and made to last. 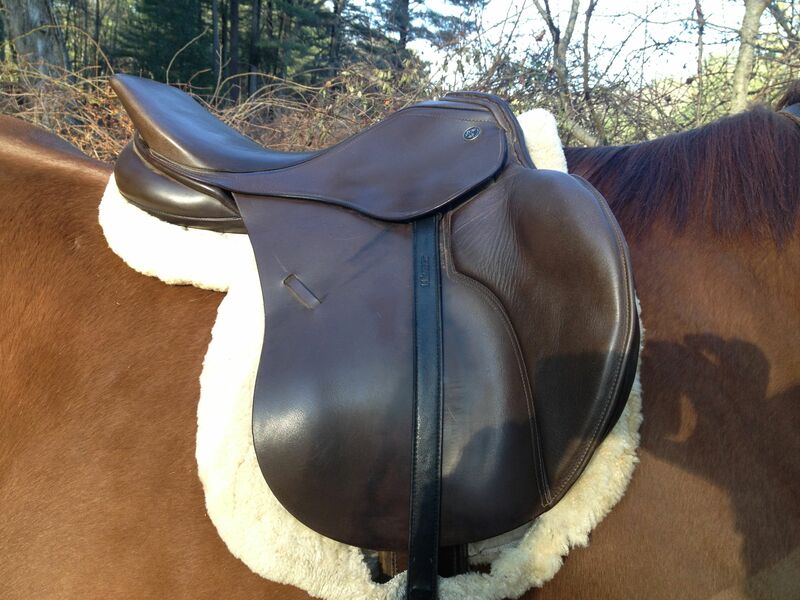 Buying a used saddle means that there’s no break in time and the price is generally right. The flexibility of an adjustable tree is helpful too. Of course, widening or narrowing a tree doesn’t mean a saddle will fit another horse, but it certainly helps. Given that I like the saddle so much, I did the logical thing (for me). I started looking for another one. Zelda isn’t going anywhere (my wonderful husband bought her for me) and obviously, I needed another saddle for her. It took me several months to find one — Kieffer jumping saddles are not that popular in the US so finding them on the used market is hit or miss. Finally I found two, both at tack stores. Here’s the funny thing about used tack — the prices, especially for saddles that are not as common as the popular brands — vary widely. One was $500 the other was $1,800. They were of similar vintage and in similar condition. Guess which one I bought! In fact, both of my Kieffers together cost only slightly more than $1K — and they are so much nicer than their price tags would suggest. The new saddle is even black so will look very spiffy on Zelda. Currently it’s a tad too narrow for her so it needs to be adjusted, but I should have it ready for riding in a month or so. As for the fourth saddle? It was a Courbette. Nice enough saddle that was a smoking good deal (less than $175) that I picked up at a silent auction. It didn’t really work for me, so I donated it to our Hunt’s silent auction in December. It found a great home with one of our riders and raised money for a good cause. At least temporarily, I’m not looking at saddle ads. I don’t know if I can beat the addiction, but right now I’m actually thinking of selling one or two that have fallen out of favor. I have to make room in case another really interesting saddle comes along! I have a Kieffer, too! I LOVE IT. I’ve had it for years and it is so comfortable. I love how sturdy and well-built it is. I bought it 8 or 9 years ago and it’s still in great condition even thought it’s the only saddle I ride in.